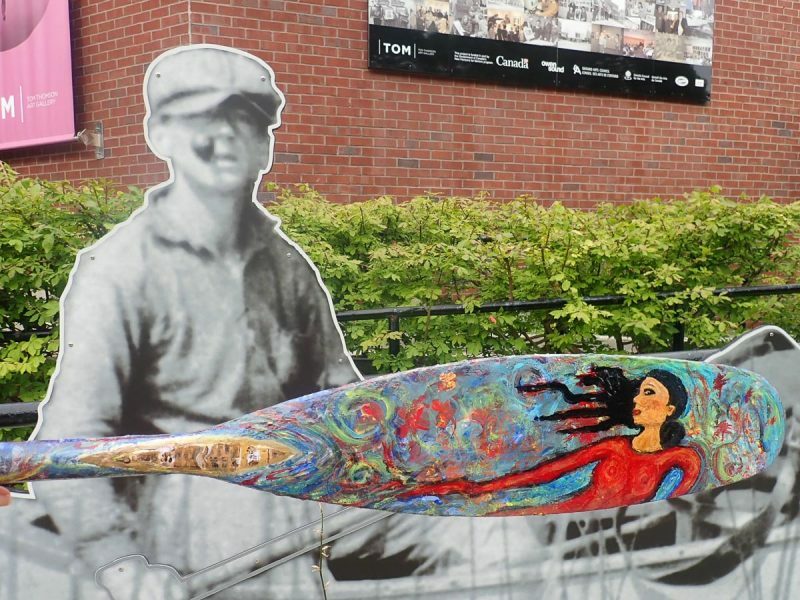 Something was calling to me to participate in the Paddle Art Contest commemorating the 100th year anniversary of the death of Tom Thomson and Canada’s 150th birthday. The moment I saw the posting about it by Algonquin Outfitters I was hooked. I currently live in BC but I grew up in Northern Ontario. I was thinking I might participate but wasn’t sure of the logistics. I have always enjoyed the paintings of Tom Thomson with his loose style capturing the beautiful Northern Ontario subject matter with his signature brush strokes. I am an ameteur painter and photographer myself inspired by my mother Sandi, an art teacher and canoe enthusiast now in her 80’s. 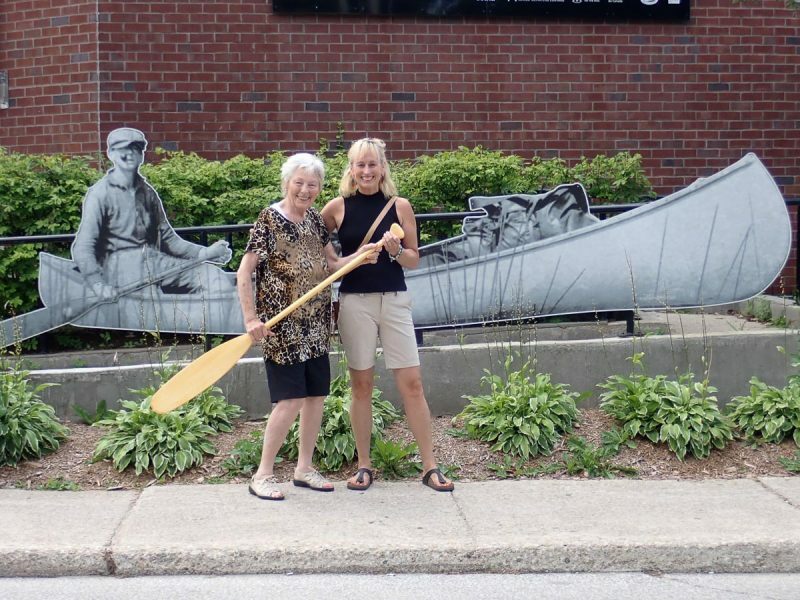 My mom was always comfortable with a paddle and a paint brush. She is the only person I have seen do an eskimo roll in a canoe. She inspired me to attend various camps and to refine my own paddling skills. Consequently, Algonquin area was the setting of my summers as a camper through to staff from 7yrs old until I was about 23. My parents retired from Northern Ontario to Thornbury, close to Owen Sound where Tom was born. My mother has been battling cancer and receives treatment regularly at the hospital there. 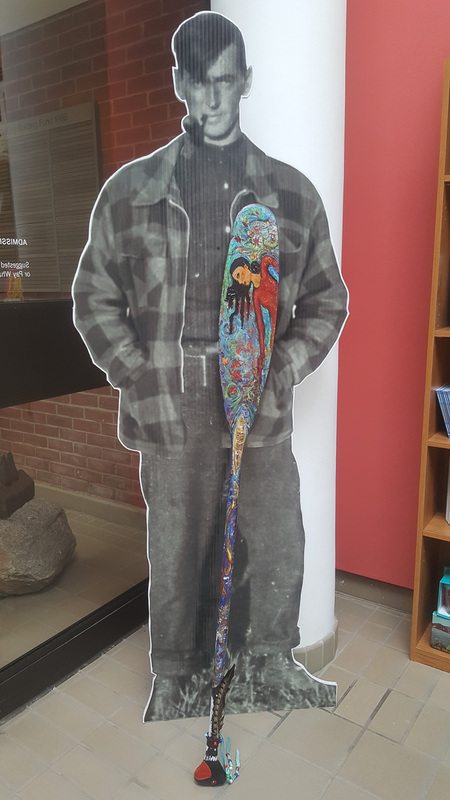 I thought it would be a nice treat to visit the Tom Thomson Museum on my recent trip home when I was taking mom for her chemo. The museum has some cool pieces of original paintings and has a great display of items Tom owned as well as a narrative of his life story. Luckily I discovered they had a few blank paddles and applications for the contest so I decided to go for it while I was visiting Ontario. I had two weeks to get the paddle done and back to the Museum. Where better to paint it then at my sister’s lake front home in Northern Ontario! As I was plein air painting the paddle to the call of the loons on Bass Lake, I thought about the lure of the wilderness to escape the maddening crowd. 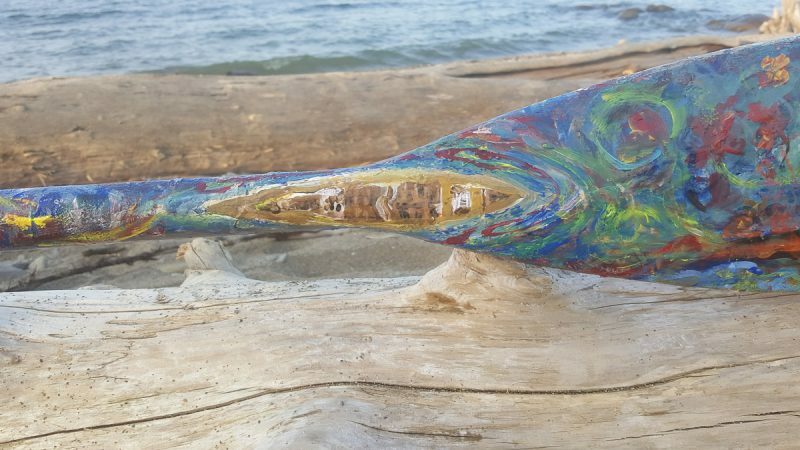 I painted birch trees on one side of the paddle and had more of a water feel with energy and fall colours floating about on the flipside, then a loon head emerged on the handle. As I played with the paint I thought about the lure that Canoe Lake in particular had for Tom. 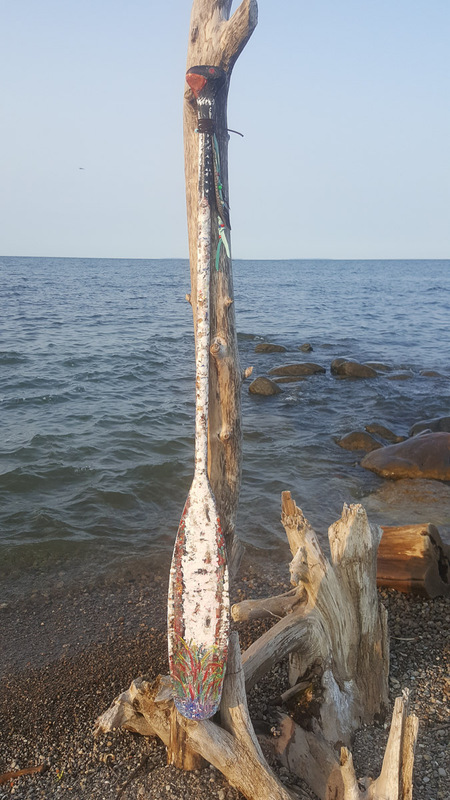 So a mistress appeared in the waters of Canoe Lake on my piece, calling to Tom to pack his canoe with paddle and paint brush to embrace the spirit of the wild. My mom gave me critique along the way and I managed to bring the finished product back to the museum in time for the contest. This is the story behind my submission to the Algonquin Paddle Art Contest 2017 entitled “The Mistress of Canoe Lake”. Thanks for a fun challenge and I look forward to seeing the other paddles that emerge for the contest. So great that you have dedicated the proceeds to local charities for the auction. Love your paddle story Nancy. I did not know your mom was a paddler extraordinaire and artist. 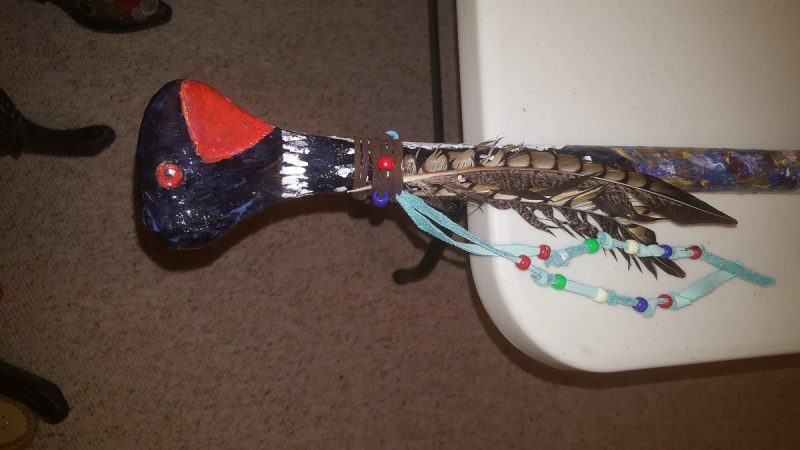 Beautiful work on your paddle and hopefully it raises a lot of money for the cause. Your materpeiece will be displayed in my home with honour. Thank you for the thoughtful comments. Congratulations Bonnie. I’m sure the Mistress of Canoe Lk has found a wonderful home. What a great contest. Bravo to Algonquin Outfitters!